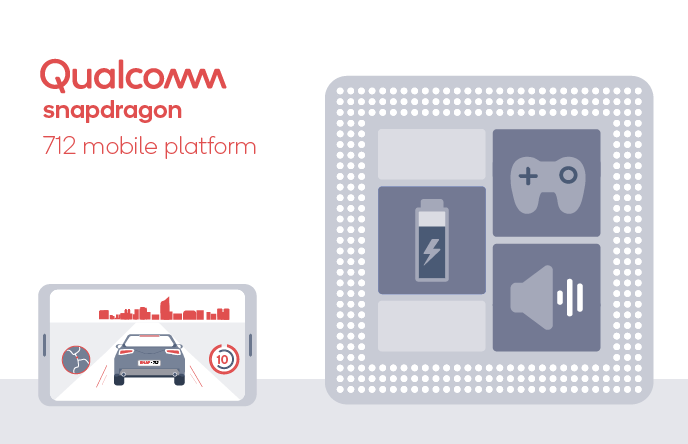 Qualcomm has launched a new chipset by expanding it’s Snapdragon 700 series. The company has launched the Qualcomm Snapdragon 712 chipset with 10 times increased performance and more features. The Qualcomm Snapdragon 712 is the successor of Snapdragon 710 which was launched last year and runs on 10nm process. It is now more powerful as it comes with a 8x Kryo 360 cores clocked at 2.3GHz which is a upgrade from the 2.2GHz from it’s predecessor. It has Adreno 616 Graphics Processing Unit and Hexagon 685 DSP. The chipset supports dual camera number up to 20-megapixel and up to 32-megapixel for single camera. The Snapdragon 712 is based on X15 LTE modem which supports speeds up to 800 Mbps for downloads and 150 Mbps for uploads. One of the highlighting feature of this chipset is that it comes with Qualcomm Quick Charge 4 support which will make the smartphone capable of charging faster than before. So overall the Qualcomm Snapdragon 712 chipset is a slight upgrade it’s predecessor and Qualcomm claims that is 10 times faster in performance as compared to the Snapdragon 710. Other than this, we soon expect this chipset used in mid-range category of smartphones. Stay Tuned for more updates on Qualcomm Snapdragon 712 and also Subscribe to Our YouTube Channel Gadget Gig For Latest News, Reviews, Unboxing and Tips/Tricks.